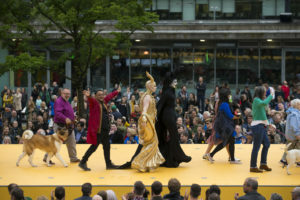 Manchester City Council has launched the city’s inaugural Culture Awards, and is asking the people of Manchester to put forward nominations. We’re putting forward the creative team for What Is the City but the People?, the opening event for 2017’s Manchester International Festival. The team was led by our Artistic Director Richard Gregory, and involved regular Quarantine collaborators: designer Simon Banham, writer Sonia Hughes and photographer Gavin Parry. They worked with composer Graham Massey and video designer Ian Galloway to bring to life an original idea from Jeremy Deller. If you were lucky enough to be at the event and loved it as much as we did, then please do nominate them to ensure they get recognised. Picture by Jon Super for MIF. The event was original, simple and bold. 150 Mancunians walked down a huge, bright yellow catwalk installed over Piccadilly Gardens, accompanied by a live music soundtrack. Large screens presented images and text revealing details about the people and their lives. They were ‘ordinary’ Manchester people, of different ages and backgrounds, many with ‘extra-ordinary’ stories. As a free event in the centre of the city, it was witnessed by around 7,000 people, including art lovers who had come specifically to see it, and commuters, visitors and passers-by who happened upon it. It was also watched by a further 125,000 viewers online. It was a moving demonstration of the city’s determination to stand together and celebrate individuality. It made us feel proud: to be Mancunians and to be part of a city that values ordinary people. Manchester City Council is accepting nominations for the Manchester Culture Awards until Sunday 22 July 2018. The top three nominees will be invited to a prestigious dinner in November, where the winners will be announced. What Is the City but the People? took place in Piccadilly Gardens on 29 June 2017.